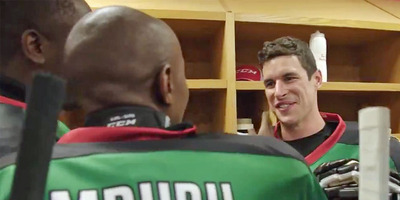 YouTube/Tim Horton’sThe Kenya Ice Lions had never played a game against another team before, so NHL stars Sidney Crosby and Nathan MacKinnon decided to suit up and help them out. As the first and only ice hockey team in their country, the Kenya Ice Lions have no other teams to play. Tim Horton’s gifted the team with a dream trip to Canada for their first game ever. Pittsburgh Penguins captain Sidney Crosby and Colorado Avalanche center Nathan MacKinnon surprised the Ice Lions in the locker room and suited up with them for the game. As their country’s first and only ice hockey team, the Kenya Ice Lions aspired to qualify for the 2018 Winter Olympics. But without any competition or a single game under their belts, the Ice Lions’ dreams never became a reality. Tim Horton’s sent the team to Canada to compete in its first-ever game, and National Hockey League superstars Sidney Crosby and Nathan MacKinnon surprised the players by suiting up for their team. The Kenyans were mesmerised. For their part, Crosby and MacKinnon had a blast playing beside the Kenyans. According to CNN’s Aimee Lewis, the Ice Lions are looking ahead to the 2022 Winter Olympics in Beijing. Considering the team only recently secured sufficient equipment and regular access to the only rink in East Africa, qualifying to play on the world’s greatest stage in just four year’s time would be quite an impressive feat. Azegere said that the team’s recent trip to Canada would help bring them one step closer to reaching their goal.